Loudoun County, VA – Infamous for committing torture, orchestrating political assassinations, and overthrowing governments, the CIA recently admitted leaving C-4 on a school bus transporting elementary and high school students before the explosive material was eventually discovered. Although the CIA is responsible for placing an explosive material inside the engine of a school bus transporting children, no agent or officer currently faces criminal charges for negligence. On Thursday, the CIA released a statement admitting that the agency left explosive material in a school bus during a K-9 training exercise with federal, state, and local law enforcement agencies in the Washington Metropolitan Area last week. Instead of removing all of the C-4 from a bus at Briar Woods High School, CIA K-9 units accidentally left some of the plastic explosive inside the engine of a school bus that ended up transporting at least 26 students from Pinebrook Elementary School, Buffalo Trail Elementary School, and Rock Ridge High School across 145 miles. Between March 21 and 24, CIA K-9 units conducted training exercises with various law enforcement agencies by hiding C-4 throughout buses and buildings at Briar Woods High School. Although the CIA initially claimed that all the C-4 was recovered after the exercise, clearly that is not the case. During routine maintenance on the vehicle, a technician recently discovered the explosive material inside the engine. After meeting with the CIA, Loudoun County Sheriff’s Office, the fire marshal, and county administrators, school officials decided to suspend all law enforcement training exercises at schools until stronger protocols are established. But marred with a history of corruption and incompetence, the CIA should not even be allowed to conduct domestic training exercises. After New York Times reporter Seymour Hersh exposed CIA corruption and massive spying programs against U.S. citizens on December 22, 1974, the government launched a series of investigations revealing illegal CIA activities. The toothless Rockefeller Commission, Church Committee, Nedzi Committee, and Pike Committee exposed several scandals and eventually led to the creation of the permanent Select Committee on Intelligence. During Operation CHAOS, the CIA infiltrated domestic anti-war groups while reading U.S. mail delivered to and from foreign countries. Operation Mockingbird, one of the first illegal programs implemented by the CIA, involved the recruitment journalists to work for the agency on a volunteer or paid basis. On October 20, 1977, Carl Bernstein wrote a Rolling Stone article revealing over 400 American journalists secretly working for the CIA. The agency manipulated hundreds of journalists, editors, and executives into reporting propaganda and false information to the American public. CIA collaborators worked within The New York Times, CBS, Time Inc., ABC, the Associated Press, NBC, Reuters, Newsweek, Hearst Newspapers, and numerous other media organizations. Between 1954 and 1961, CBS President Sig Mickelson compromised journalistic ethics by secretly entering into an agreement with the CIA. 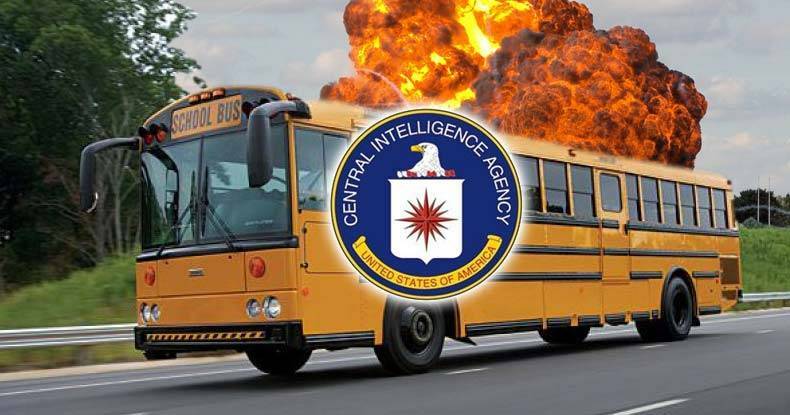 Plagued with incompetence and corruption, the CIA has no business conducting domestic operations or training exercises that involve placing C-4 on school buses occupied by children. Given the agency’s history of mixing cement powder into the milk sent to a secondary school in Havana, the CIA should not be trusted around anyone, especially children.